Save card details for future transactions. Use arrow keys or space bar to navigate in the presentation. Verify your identity when communicating with the API by providing a secret key in all your requests. API keys start with “sk_”. They are available in My account, then API Credentials in the PayPlug portal. Access LIVE and TEST modes using the same endpoint. To switch between modes, simply provide the related secret key to the mode you wish to access. Create the payment using save_card = true; a link to a payment page will be generated. 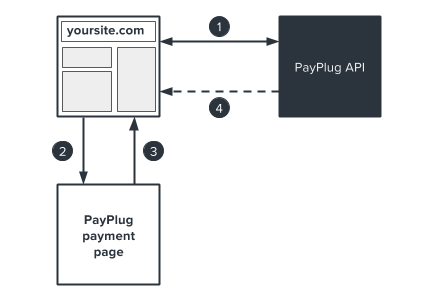 Redirect the customer to the payment page. After entering card details, your customer is automatically redirected to the previously-indicated return page on your site. PayPlug sends you a confirmation including the secure card ID via IPN (Instant Payment Notification). All amounts must be expressed in centimes as positive whole numbers (1€ = 100 centimes). When creating a payment, you can specify a notification URL for use with IPN: notification_url. Whether the payment is successful or fails, a POST query containing an object corresponding to the payment will be sent to your server. You may now extract the card ID from the object in the IPN. This is what you will use to initiate future transactions. We recommend that you also document the card’s expiration date in order to verify that the card is still valid before attempting future payments. Create the payment using payment_method and the previously saved card ID. PayPlug sends you a confirmation via IPN. Your customer will receive a confirmation email after each new transaction. Customers can pay securely without typing in their card details for every purchase. Customers can subscribe to services on your site using recurring payments. Customers can pay in three or four interest-free instalments (within a maximum 90-day period). Please note that recurring payments and instalments are not automated; you will need to manage the payment schedules internally.